Whether you have lived in the desert areas of the southwest United States for many years or are just moving to the area, an exciting feature are the many fruit trees that can be planted on your property. When coming from the colder parts of our country, the thought of going out to your yard and retrieving a fresh grapefruit or orange is always at the top of the list for anyone in the Phoenix area. In this article The Green Goddess will give you a list of some of the easiest fruit trees to plant and maintain. What can be more satisfying than picking oranges off your tree and making refreshing and all natural orange juice? Orange trees are a staple in the desert southwest and in our area. With many types of trees to choose from there are three basic groups; Valencia, Navels and Arizona Sweets. Navel oranges are seedless and are easy to peel but the juice doesn’t last long and turns bitter faster. Fruit production is not as good on these trees and because of our heat, fruit often drops too early in June. Valencia’s are sweet oranges that have a deep orange color and produce a delicious juice. They usually ripen around February or March. Arizona Sweets have an abundance of juice and sweet refreshing flavor. They grow very vigorously in our area and can ripen as early as October. Always ask your Green Goddess representative for any help in the best way to plant your citrus tree. 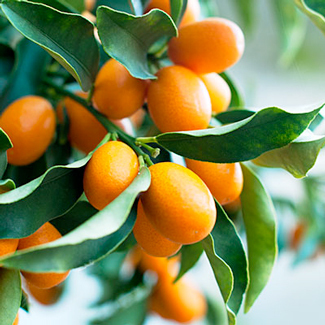 Planting your orange tree requires you to loosen soil in a large area where you are planting. Remove this soil only as deep as the container but keep it wider. Make sure the level of soil in container is same as the surrounding soil. Fill in the area where you are planting the tree and water briskly. Citrus trees need to be watered deeply but not frequently. A new plant needs to be watered often the first few weeks, but after that once a week during summer and only once a month during the cool season. Duncan which matures from November to May, are large seedy grapefruits with a fantastic sweet flavor and are very juicy. Star Ruby also matures around November to May and has a thin skin with dark red flesh color. A slow growing grapefruit that is sweet and juicy. Pummelo, Oro Blanco matures November to March and is an easy to peel grapefruit with a thick skin, a green to yellowish skin with white flesh. This juicy fruit has a sweet to tart flavor. Grapefruit trees are usually 16-20 feet high but can grow larger. Their leaves are generally dark green and thin. Growing an apple tree can be great fun. With so many types of trees it is best to select a tree that grows best in your area. In planting your apple tree it is best to purchase a 1 year old tree approximately 4-6 feet with a good root system. Apple trees are tough and grow well in most soil conditions, but need full sun, good air circulation and water drainage. Make sure the entire planting area is large and then fill in according around base. Water thoroughly for first two weeks. Dorsett (Golden) grow great in our area with a crisp refreshing taste. With good production these medium size apples are sweet and have a golden color when ripe. Anna apple tree – this large apple has a greenish-yellow skin with a hint of red. Anna’s are slightly tart, sweet with white flesh. This is a great apple for applesauce and homemade pies. Fuji is a medium sized, dull red, very sweet apple. It usually matures in August. It is crispy with a lot of flavor and aroma. This easy to grow apple is a favorite for any house. For success in growing any fruit trees, make sure they are purchased from a reliable and reputable nursery. A reputable nursery, like The Green Goddess, stands by their product and makes sure they are free of insects and disease and make sure fruit trees are true to name.